…. SOLD – Similar 1930’s Motor-Yachts Required …. 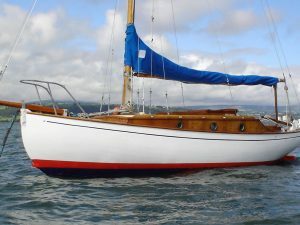 Avila was built to a John Bain designed (based on his famous Silver-Leaf) by James Silver Ltd. of Rosneath for George Besty and was commissioned on 8th April 1939. George had little time to enjoy his new boat which was requisitioned later that year by HM Government for coastal patrol and special war duties on The Clyde. 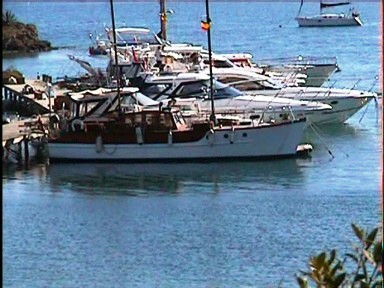 After the war Henry McManus of Annesley, Dumbarton became Avila ‘s second owner, Henry being a member of the Royal Scottish Motor-Yacht Club. A few years later he sold the boat to B Searle of Sudbury, Suffolk and Avila moved South. During the late 1950’s and early 1960’s J C Dudgeon of Africa House, Kingsway, London was registered owner. He replaced the original Morris petrol engines with 56hp Parson Diesels in 1962 before selling her in 1966 to A J Fry of Clevedon, Somerset who kept the vessel at Southampton. 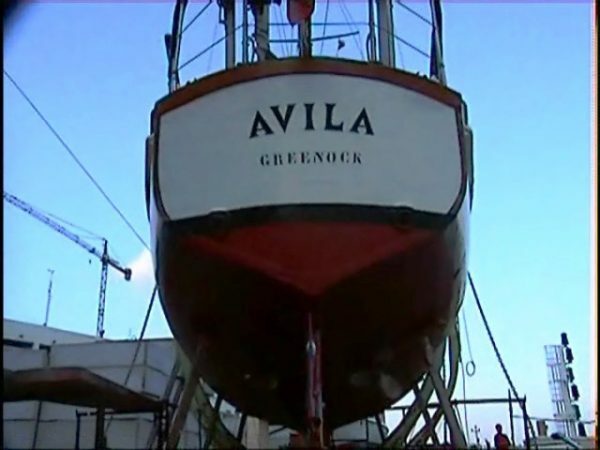 By 1970 Avila had another new owner, D M Russell of Newton Mearns, Renfrewshire and Avila headed back to home waters and a mooring at Rosneath. 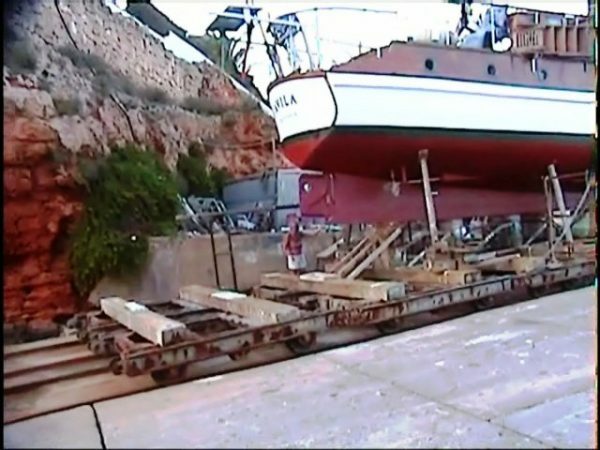 Avila was re-engined with Perkins 72hp diesels in 1974 in the ownership of R MacInnes of Sleat, Isle of Skye who kept her on a mooring at Ord. 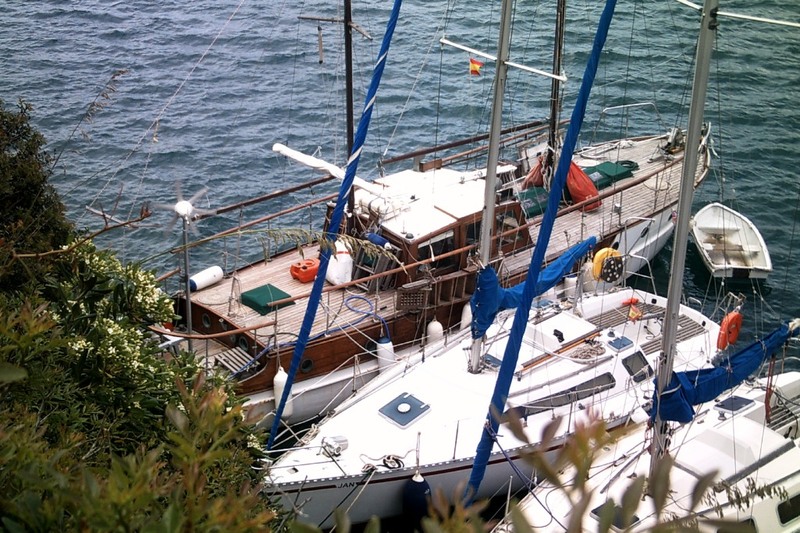 During the 1980’s Alistair Macneill-Weir of Beith, Ayrshire acquired the vessel keeping her in Tarbert before selling to the present owners in 1987. Since then Avila has made several extended passages from England to Spain and back. 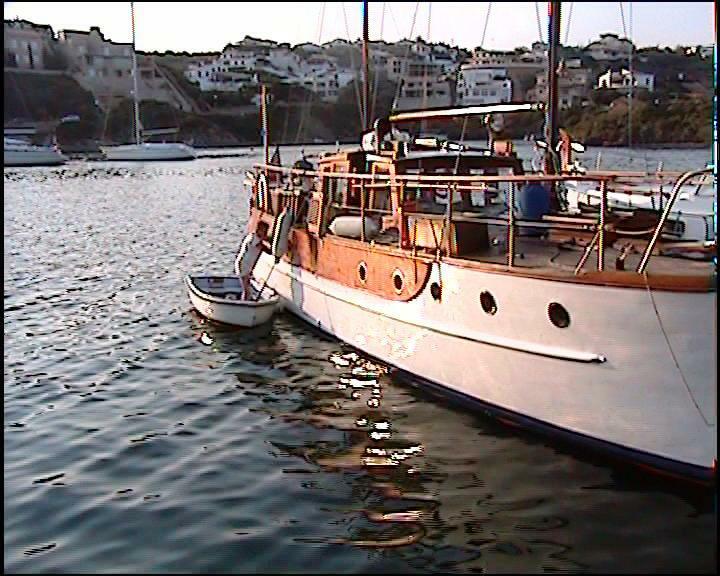 She is now stationed in Menorca an ideal base for exploring the Med or living aboard as the current owner have done for many years in the past. CARVEL PITCH PINE HULL WITH VARNISHED SHEER PLANKS ON OAK TIMBERS AND FRAMES. TEAK SUPERSTRUCTURE. TEAK DECKS. TEAK INTERIOR. IRON BALLAST KEEL. TWIN PERKINS 4236 M 72 H.P. DIESEL ENGINES WITH BORG WARNER GEAR BOX TO EACH ENGINE. ENGINES SERVICED REGULARLY BY OWNER. CRUISING SPEED 8.5 KNOTS. G.P.H. AT CRUISING 2.5 GALLS per hour. RANGE APPROXIMATELY 500 N.M. MORSE CONTROLS. SHAFT DRIVE TO PROPELLERS. 1 x 180 AMP HOUR BATTERY ON EACH ENGINE. 90 AMP ALTERNATOR OR 220 VOLT CHARGER. RUTLAND 913 WIND GENERATOR. RWS 200 RUTLAND CHARGE REGULATOR. 60 WATT SOLAR PANEL. 3000 WATT INVERTER 12 TO 220 VOLTS. 2 STORAGE BATTERIES OF 180 AMP HOURS EACH AND 1 BATTERY OF 75 AMP HOURS. 220 VOLT SHORE SUPPLY. V.H.F. NASA MARINE SX 35 DSC. FUEL HOLDING CAPACITY 140 GALLS APPROXIMATELY. PLASTIC CONSTRUCTION TEKA TANKS. NEW IN NOVEMBER 2002. WATER HOLDING CAPACITY: 120 GALLS. METAL CONSTRUCTION. PRESSURISED HOT AND COLD WATER . WATER HEATED BY CALORIFIER AND ELECTRIC IMMERSION HEATER. FROM THE ABOVE AND A DOOR TO THE FRONT. DRESSING TABLE WITH 4 LARGE DRAWERS AND LOCKER. HATCH TO AFT DECK. DOUBLE 220 VOLT PLUG SOCKET. 1 X DIMPLEX 500 WATT ELECTRIC HEATER. BLAKE TOILET, SHOWER AND WASH HAND BASIN, VANITORY UNIT. FULL LENGTH WARDROBE WITH SHOE STORAGE. 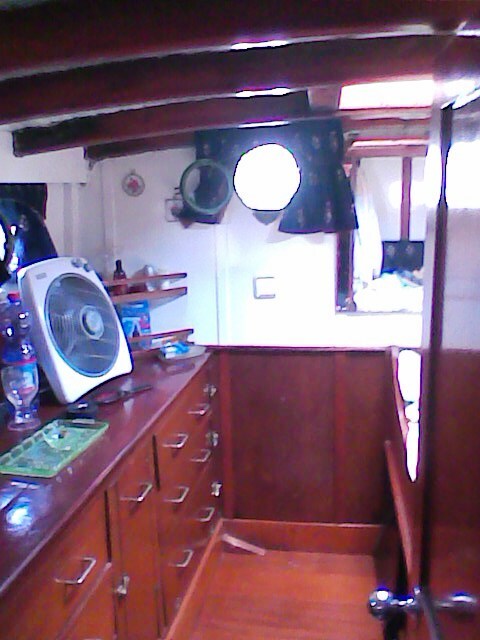 BOSUN’S LOCKER, HOUSING AUTOMATIC WASHING MACHINE AND TWO SHELVES. 1 X SINGLE 220 VOLT PLUG SOCKET. SOLID TEAK CONSTRUCTION. 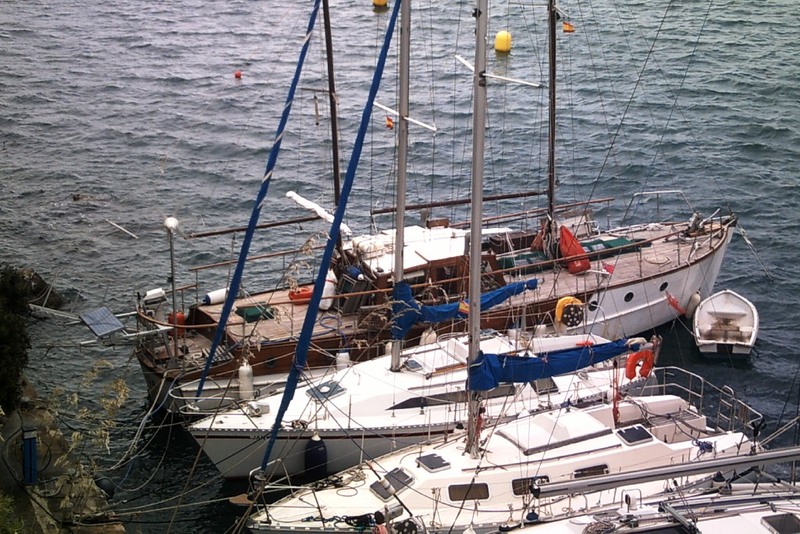 ACCESS TO DECKS PORT AND STARBOARD. 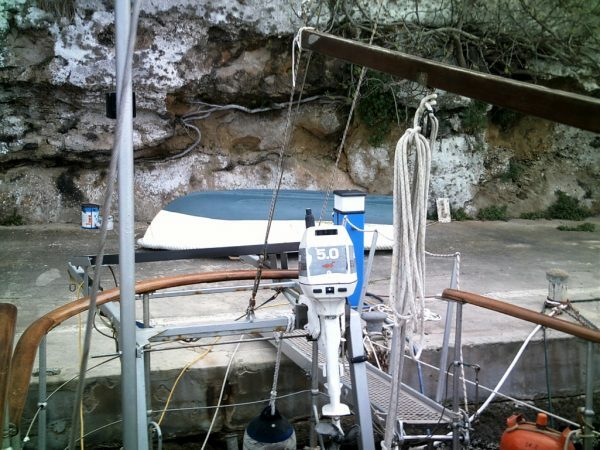 PILOT BERTH. CHART TABLE. CAPTAIN’S SEAT. TEAK FLOORING. ACCESS TO ENGINES UNDER. 1 X DOUBLE 220 VOLT PLUG SOCKET. SETTEES TO PORT AND STARBOARD IN PATTERNED WINE COLOUR FABRIC, (RE-UPHOLSTERED MAY 2011). CONVERTS TO FOUR SINGLE BERTHS. TEAK DROP LEAF TABLE. TEAK COCKTAIL CABINET WITH LEADED GLASS DOOR, DRAWER AND LOCKER UNDER. DISPLAY UNIT WITH 2 CUPBOARDS AND STEREO RADIO/CD PLAYER. FULL STORAGE UNDER SETTEES. TEAK PANELLING AND TEAK FLOORS. 1 X DOUBLE AND 1 X SINGLE 220 VOLT SOCKETS. 1 X 1000/2000 WATT ROWENTA WALL MOUNTED FAN HEATER. 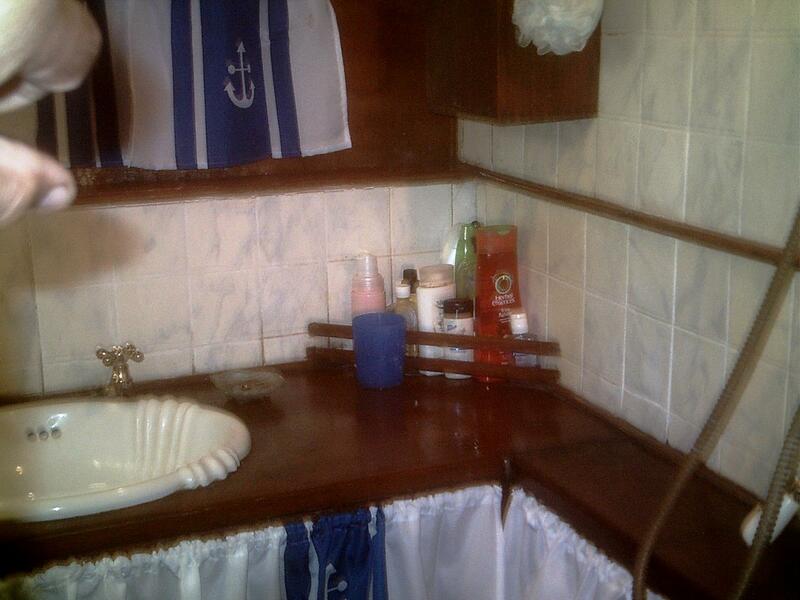 TO STARBOARD: FULL SIZE STAINLESS STEEL SINK WITH DRAINER, MIXER TAPS AND CUPBOARDS UNDER. 2 CUPBOARDS ABOVE. TO PORT: STAINLESS STEEL 4 BURNER GAS HOB.FRIDGE. BULKHEAD MOUNTED EYE LEVEL MICROWAVE. 1 X JML HALOGEN ELECTRIC OVEN, LARGE WORKTOP WITH CUPBOARDS UNDER. ALL WORKTOPS AND CUPBOARD DOORS FINISHED IN BISCUIT COLOURED MELAMINE WITH TEAK TRIM. LARGE STORAGE RACK AND LARGE SPICE RACK. 5 X 220 VOLT SOCKETS. 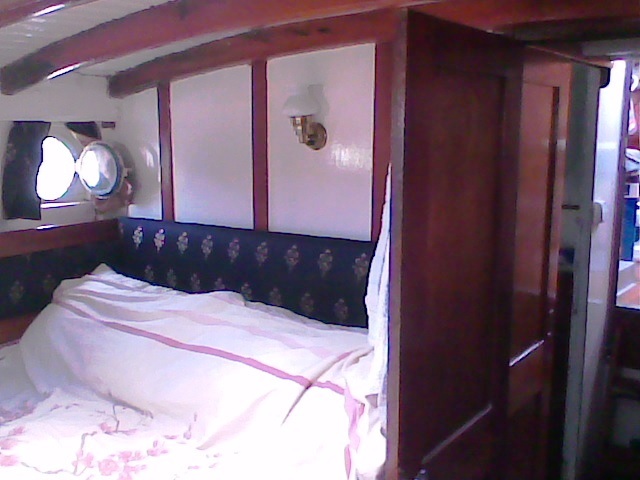 TO STARBOARD DRESSING TABLE AND WARDROBE. 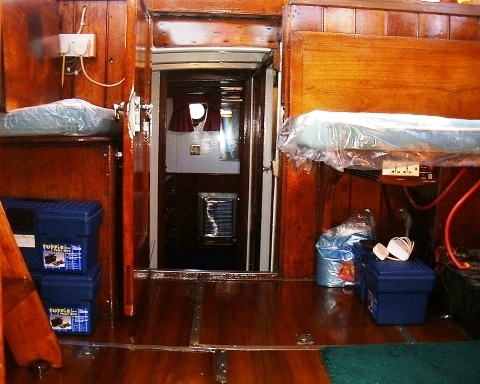 TO PORT: SINGLE BUNK WITH PIPE COT OVER AND TWO DRAWERS AND LOCKER UNDER. HATCH AND LADDER TO FORE DECK. 1 x DOUBLE 220 VOLT PLUG SOCKET. 1 x DIMPLEX COLD WATCHER 500 WATT CABIN HEATER. EN SUITE BATHROOM WITH BABY BLAKE TOILET, SHOWER AND WASH HAND BASIN. ANCHORS: 1 X CQR. 1 X FISHERMANS. SIMPSON LAWRENCE ANCHOR WINCH. 70 mtrs CHAIN. 3 X ELECTRIC BILGE PUMPS & FLOAT SWITCHES TO EACH. 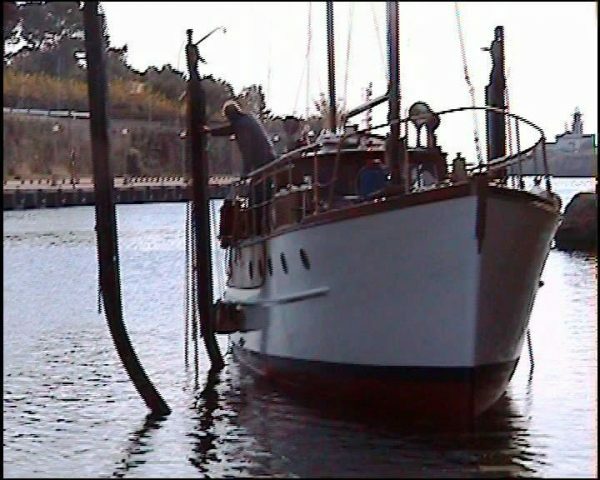 MAIN MAST AND MIZZEN MAST (PINE). JIB. MAINSAIL. MIZZEN SAIL. ELECTROLUX GAS/12 VOLT/220 VOLT FRIDGE. FRIDGIDAIRE F.V.E. 509. 4 STAR 220 VOLT FREEZER. CANDY AUTOMATIC 3 WASHING MACHINE. CREDA T320 V W TUMBLE DRYER. 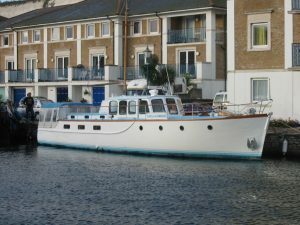 Avila is one of the desirable Silver-Leaf type designs produced by the successful naval architect John Bain during the 1930’s. 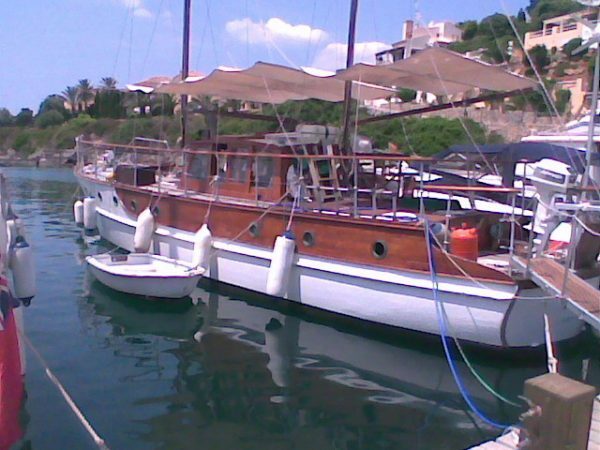 An attractive, stylish and comfortable twin screw motor-yacht retaining many original features and period charm. 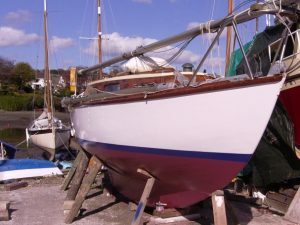 Only offered for sale due to the deteriorating health of her long term owners who are unable to continue enjoying this fine old vessel. Owner supplied images. Lines plan shows standard 40ft. Silver-Leaf. Viewing: Through the brokers, Classic Yacht Brokerage.